If you happen to be living under a rock then let me inform you that the French house duo and music geniuses, Daft Punk, were the big winners of the 2014 Grammys taking such honors as Record and Album of the Year. As a huge fan of them, I was very happy to see the academy finally honor a band that has been making innovative music for over 20 years. 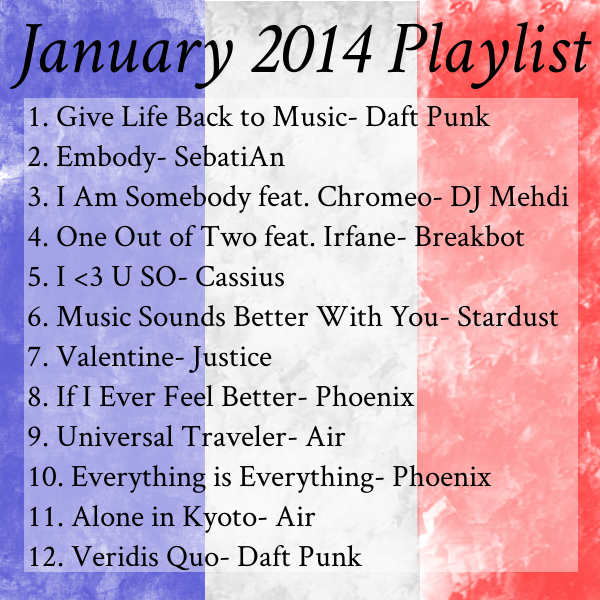 To honor them I've decided to kick off 2014 with a playlist filled with songs by French artists that have an incredible passion for music which comes through in their music. When it comes to music, the French are in a whole other world. They are always looking forward when creating new music, even if sometimes it requires them to pay homage to the people and music that inspired them like in the case of Daft Punk. One of the reasons why Random Access Memories was my favorite album of 2013 was because it was unlike anything that was being released at the time, yet the music sounded familiar and comforting to me. The album kicks off with the track Give Life Back to Music which is exactly what Daft Punk delivered to the masses in 2013. Music that was less about flashy gimmicks and more about bringing back the magic that has been lost in the music industry. People often dismiss Daft Punk and other electro artists because they are uneducated and assume that it's easy to create music on a computer. There's so much more to being a DJ than pressing buttons that people just don't seem to grasp. In the case of Daft Punk, they are also multi-instrumentalists, producers, composers, and vocalists. Thomas and Guy-Manuel also don't care about the fame that comes with being a musician, hence why they've been wearing masks since their second album, Discovery. Their music is able to make people emotional and transcend both language and cultural barriers. In this playlist I've featured Daft Punk along with many of their friends who also create innovative and heartfelt music. Which song did you enjoy from the playlist and what did you think about the Grammys? Let me know in the comments below.